I saw them on the front of my Giant Eagle ad a few weeks ago and knew I must try them. As luck would have it, about two days later I got an e-mail from MyBlogSpark inviting me to try Chocolate Cheerios - how could I say no? Let me start by saying we are big Cheerios fans in my house. We enjoy the original yellow box, the Honey Nut Cheerios, the Frosted Cheerios, the Fruity Cheerios and the Banana Nut Cheerios. On a few occasions, we have had the Apple Cinnamon and the Multi-Grain, but not as often as the others. I like that Cheerios are a good breakfast and a good snack. My kids have been eating them dry since they could pick them up and with milk since they could manage a spoonful of cereal and milk. They are one of my favorite cereals (along with Cocoa Puffs). When the box arrived, I made the kids wait until Saturday to try it. I don't eat cereal and milk at home during the week, because I don't usually have the time. I was worried that if I let them open it, it would be gone before I got to give it a few tries. The cereal delivers on the chocolate flavor without being overly sweet. I like that. My kids saw them as a treat (much like they do Fruity Cheerios and Banana Nut Cheerios) because they taste a little sweeter than regular Cheerios, plus let's be honest - they are chocolate and that has to make them special. I like that the Chocolate Cheerios is low in fat and only has 100 calories per serving and that it is made with whole grains (it carries the Whole Grain Guarantee that there are 8g or more per serving). One of the things that was included in my e-mail was a recipe for Chocolate Cheerios Marshmallow Hearts. Now, if there is one thing besides chocolate that I like it is marshmallows - how could this recipe not be great? I'm thinking that most of the time, I would go with squares, but for Valentine's Day the hearts would certainly be cute. I haven't made it yet, but you can find a copy here if you would like to try it. Which variety of Cheerios is your favorite? You can go here to see a full assortment. Follow @ABusyMomofTwo on Twitter and tweet about this giveaway. You may complete this entry once per day. Giveaway will remain open until February 17th at 6 pm. One winner will be selected using a random number generator. The winner will be contacted by e-mail (be sure to leave one!) and will have 48 hours to respond or a new winner will be selected. I received no compensation for this post. All opinions expressed in this post are mine. 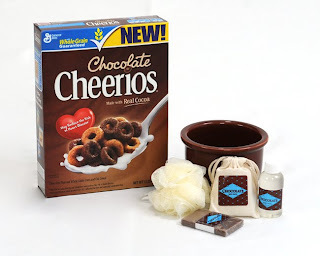 I received one Chocolate Cheerios gift pack for myself and one to giveaway, courtesy of Cheerios and MyBlogSpark. I love Frosted Cheerios! They are a sweet treat without all the calories and fat. Thanks for the chance at a great giveaway! I just tried the Chocolate Cheerios and they have surpassed Honey Nut as my favorite! I LOVE them!!!! I'm a subscriber. Thanks for the giveaway! I haven't heard of the chocolate...yum! My fav is Honey Nut! Thanks for the giveaway. I love Apple Cinnamon and Multigrain but that's prob because I haven't tried the Chocolate ones yet! I am a fan of the honey nut! Apple Cinnamon are my favorite with honey nut running a close second. I haven't tried the chocolate ones yet but would love to! I like Cheerios Crunch. I just saw the chocolate in the store! So far, Honey Nut cheerios is our favorite, but we're waiting for Chocolate Cheerios to go on a really good sale so we can try them. I love the Berry Burst Cheerios! Though, not all stores carry them. Honey nut cheerios are my favorite. Our favorite are the new Banana Nut Cheerios! My favorite are the original in the big yellow box. I haven't tried these chocolate ones yet, but I'm guessing they will be my new favorite. We like all varieties of cheerios, especially honey nut. I'm with you, Busy Mom--Chocolate Cheerios are my new favorite! I love the plain ol' regular Cheerios n the yelloe box but I know the children would go crazy over the new Chocolate Cheerios. I love the yogurt Cheerios and I can't wait to try the Chocolate!! Yummy! I e-mailed my friends about your giveaway! Thanks!!! tweeted and a follower! Thanks!! Honey Nut Cheerios are my fave. Honey Nut Cheerios are our favorite, but we would love to try the Chocolate too. Thank you for the chance to win! I like Multi Grain Cheerios best. Thanks for the giveaway! My fav is the multigrain cheerios. Its sweet enough that i dont need to put sugar in it like the regular cheerios. I think my favorite is Honey Nut Cheerios... I could eat a ton of them! My favorite is the Multi Grain Cheerios. 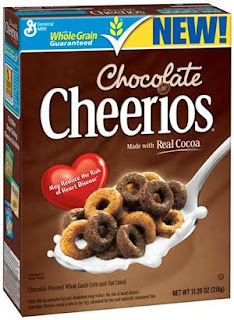 I love Honey Nut Cheerios but Chocolate Cheerios could be my new favorite!! I love Cheerioes especially Honey Nut. But these chocolate cheerios look interesting. Fave Cheerios are Honey Nut. Yum. Honey Nut Cheerios is my favortie! The frosted cheerios are my fav. The chocolate cheerios are my new favorite. They're a great snack. I like Honey Nut the best! I am feed subscribed with Google Reader. The honey nut cheerios are great. Just became a subscriber by e-mail. Favorite is the Cheerios Crunch! I was super excited about the Choco Cheerios too! I like the frosted cherrios. Just became a new subscriber. I like the multigrain Cheerioes. Mmmm... Haven't had a chance to try the chocolate ones.